The McKelvie Group is very organized, friendly, and transparent. We needed a realtor ASAP and we remembered Stefany from a few open houses where she made a great impression on us. She helped us every step of the way in buying our new home, and there was almost no stress the whole time thanks to her guidance. The recommended businesses in their information packages worked out fantastically for us, as well. We couldn't have been happier with the whole process. Stefany De Gregorio was born in Edmonton and raised in Calgary, a true Albertan through and through! 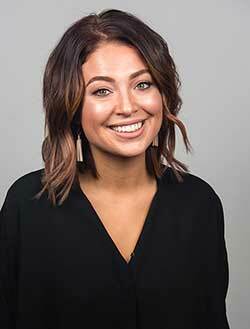 With a family business in construction and a background in new homes sales with one of Calgary's top home builders, it was no surprise that Stefany chose a career in real estate with The McKelvie Group. Along with her experience in home building, she has taken numerous courses in customer service, and is a certified interior decorator. All of these elements making her a valuable asset for her clients as well as her team. Her goal is to provide clients with the right tools so that they can achieve their home ownership dreams. Stefany enjoys spending time with her extended Italian family, as they are extremely supportive and full of spirit. When not with her family, Stefany's beloved French Bulldogs, Kevin and Debra, keep her active. Stefany also volunteers with Pawsitive Match Rescue Foundation- a Calgary organization that rescues dogs from not only Canada, but other countries where aid is needed. Your Calgary Real Estate & Customer Reviews, Testimonials & Comments are a valuable indicator of Stefany De Gregorio performance and is a reflection of his/her reputation. Hearing how your experience was during your real estate transaction is the best way to ensure we are providing a service in line with our customers needs and expectations.